This campaign ended on May 06, 2018, but you can still make a gift to Miami Dade College by clicking here! We are officially out of the limited-edition alumni stoles! Thank you Class of 2018 for all of your support! The 2018 MDC Class Gift is an opportunity to start a tradition for future students! 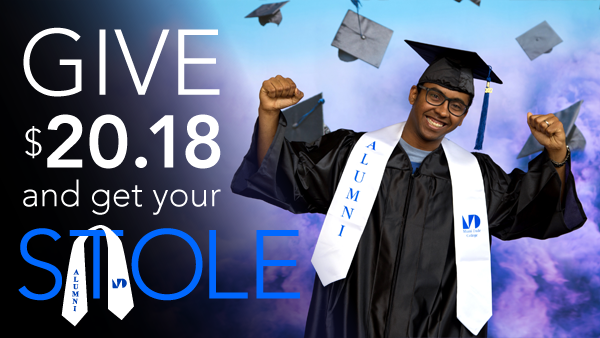 Show your appreciation for the many opportunities you had at Miami Dade College by making your gift to the 2018 Class Gift Scholarship Fund. With 76% of our students requiring financial assistance, every gift, no matter the amount, truly makes an impact in the lives of our future Sharks. MDC Foundation would like to thank you for your gift of $20.18 or more, with a limited-edition alumni donor stole to wear at Commencement! Send a message to your classmates, and to the MDC community, that you took action to pay it forward for students after you. Don’t miss out on this incredible opportunity to support your alma mater! Please note that this limited-edition stole is not available at the MDC bookstores. 2 ways to pick up your alumni stoles: 1) Visit the Alumni Relations Office located in Building 1, 4th Floor of the Wolfson Campus (M-F 8:30 a.m. - 5:00 p.m.), or 2) Visit the Alumni Relations table at your Commencement ceremony. If you have any questions, reach out to Yessenia Perez, Annual Fund Manager, at yperez11@mdc.edu, or 305-237-3240.